Will McDonough, a sports reporter and columnist for The Boston Globe for 41 years whose byline made readers sit up and take notice, died of a heart attack at his home in Hingham on Thursday night. He was 67. For those legions who follow sports in Boston, across New England, and around the nation, the name Will McDonough above a story signaled that reliable, and often exclusive, news was coming along. In-depth information, gleaned from countless sources on the street, on the field, in the clubhouse, and in executive offices, and laced with perspective - about players, teams, officials, games, corporations, and fans - was the grit from which Will McDonough fashioned his stories. He prided himself on delivering news that counted - "scoops," as traditional journalistic parlance has it - in the simplest of words. Although he didn't like the word "pioneer," Mr. McDonough was one. In the late 1970s and early 1980s, he was a charter member of a small company of print journalists who, while maintaining their newspaper positions, worked as reporters and commentators on television. 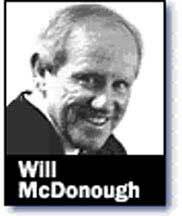 In the days before the Internet, Mr. McDonough's Sunday edition professional football notes columns were staples in the studios of every network covering the NFL, and CBS took the unprecedented step of offering him an on-air job. "I proved once and for all you don't have to be pretty to be on television," he liked to say of his work at CBS and, later, at NBC. In recent years, Mr. McDonough continued to appear regularly on television and radio broadcasts. He did a weekly national radio show (he taped his last one Thursday morning) with former Patriots (and now Dallas Cowboys) coach Bill Parcells for Sporting News Radio (heard locally on WWZN, 1510-AM). He also appeared regularly on his son Sean's "The McDonough Group" on that station, and he was a co-host with his former longtime Globe colleague Mike Barnicle each Friday on WTKK (96.9-FM). He also was a staple of Ch. 4's "Patriots Pregame," "5th Quarter," and "Sports Final" shows with host Bob Lobel. Born in July 1935, he kept an oar in the waters of his native neighborhood all his life despite his move to Hingham early in his Globe career. Few knew better than he the whos, whats, wheres, whys, and hows of life in South Boston from the 1940s to the present. He was an acquaintance of numerous celebrated - and infamous - sons of "Southie" and to his last day supported in words and deed those whom he called friends. And these friends returned the favor when Reporter McDonough called on them to help with a story. The McDonough byline first appeared in the Globe in the late 1950s when he was a student at Northeastern working as a co-op in the sports department, mostly covering school sports. He had been a three-sport player at English High School, but injuries pushed him to the sidelines, and, eventually, to the press box. It did not take him long to get his reporter's feet on the ground when he was hired onto the Globe staff shortly after his graduation from college; he covered whatever was thrown at him and always delivered on time. Professional football was Mr. McDonough's main interest for most of his Globe career (he left the paper for a brief period in 1973 to go to work for the late Bob Woolf's player-management firm), and he was proud of his status as one of the very few writers still working who had covered every Super Bowl. But he kept his keen eye on everything else that was going on around town, especially at Boston Garden, the FleetCenter and Fenway Park, and was able and willing on a moment's notice to cover events at those venues when his editors were stuck. When the opportunity came in the 1980s for him to write a weekly notes column for the Saturday edition, he was well-prepared. From the first such column to the last, just a week ago, Will McDonough produced must-reading copy not only for Globe readers but also for the movers and shakers in sports locally and nationally. As to his health, Mr. McDonough dealt with his middle-age heart problems, which began a decade ago, the way he dealt with his stories: You do your work, you play it straight, and you tough it out, knowing you've given it your all. On a visit to the Globe last Friday, he mentioned that the medication he was taking after a recent cardiac procedure made him feel "dopey," but he was looking forward to resuming his exercises. "When you have heart disease," he said, "you know another blow is coming. The important thing is to be in the best shape you can to give yourself the best shot at surviving it." McDonough leaves his wife, Denise, two daughters, Erin of Norwell and Cara of Hingham; three sons, Sean a nationally-known sportscaster of North Quincy, Terence of Raleigh, N.C., and Ryan of Hingham; three sisters, Sister Mary Martina McDonough, SND, of Hingham, Ellen Eccleston of Roseville, Calif., and Margaret McDonough of Weymouth; a brother, Martin of Hyde Park; and four grandchildren.